Ideal for beginners and intermediates to learn coding C on MSX, and install a powerful tools-chain. Also high-level coders may have all information available in one paper book. 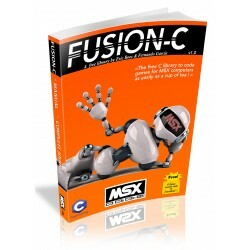 This book will teach you how to install and use a free tools chain, allowing you to easily program with FUSION-C. Automate the compilation of programs, and test them on an MSX emulator All C and FUSION-C commands are described, and a C ‘memento’ will teach to beginners how to start coding in C language. Also the technical aspects of the MSX computers are detailed to give you every chance to succeed in your projects.